There has been much discussion about the demographic makeup of the 2012 electorate, and one thing is clear: Women’s voices determined the outcome of the election. Across the board, women made the difference. 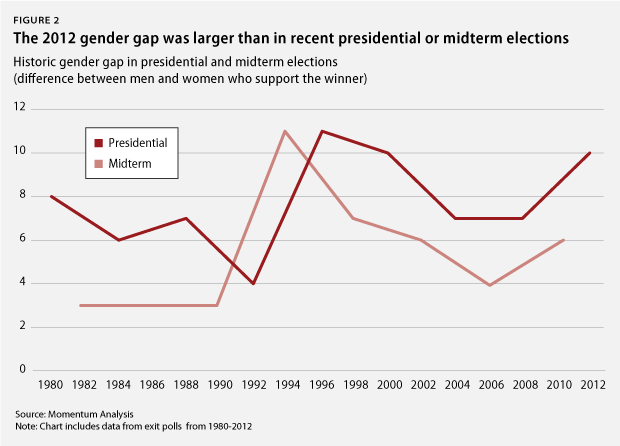 Here are seven key facts about women voters and the gender gap in the 2012 elections. 1. Women were the majority of voters. According to exit polls 53 percent of the voters in the 2012 elections were women—more than one out of every two voters across the country was a woman. Moreover, 55 percent of those women cast votes for President Barack Obama. 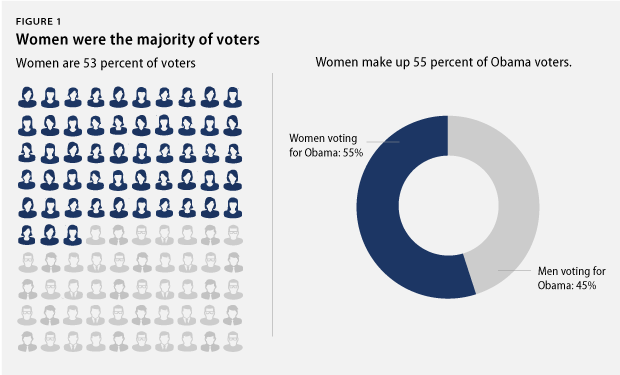 Women who voted for President Obama made up 29 percent—nearly one-third—of the electorate. 2. The gender gap grew to 10 points. 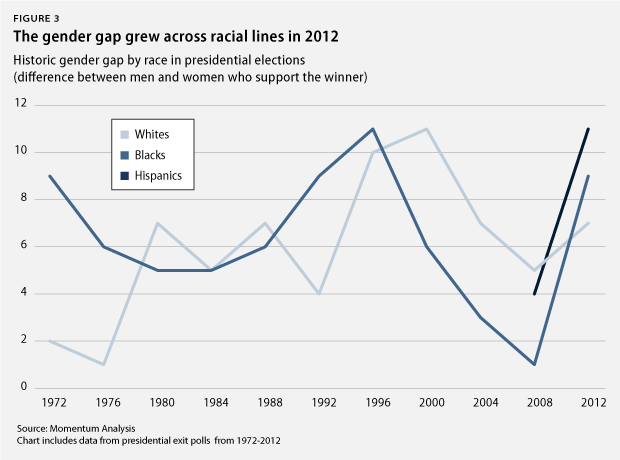 The gender gap is defined as the margin between men and women’s support for a candidate. 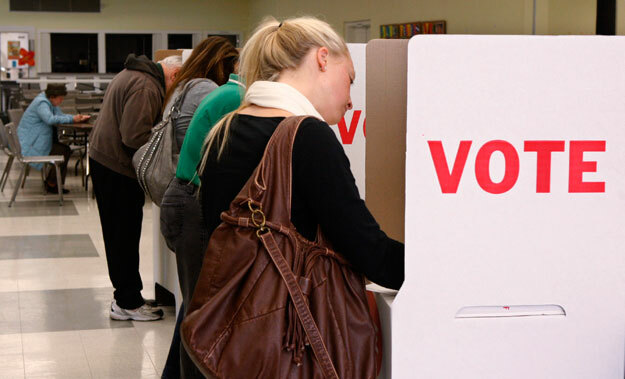 It’s the best way to measure how men and women’s voting patterns differ. According to official 2012 exit polls, President Barack Obama had a 10-point gender gap over his Republican rival, former Massachusetts Gov. Mitt Romney—higher than in most (but not all) presidential races since 1980. 3. Women decided the election. This past November women determined the outcome of the presidential election. Only in President Bill Clinton’s 1996 victory did a candidate succeed by winning with women and losing with men. Again, according to official exit polls, in both of their first terms in office, President Obama and President Clinton won with both genders. In neither of his campaigns did President George W. Bush win with women, although previous Republican presidents did. 4. The gender gap extends beyond women of color. The gender gap widened considerably with Latinos and African Americans this year, but also with whites. While President Obama’s support with white women declined, his gender gap among whites grew and was the same as former Democratic presidential candidate John Kerry’s gender gap in 2006 and larger than President Clinton’s 1992 gender gap among whites. 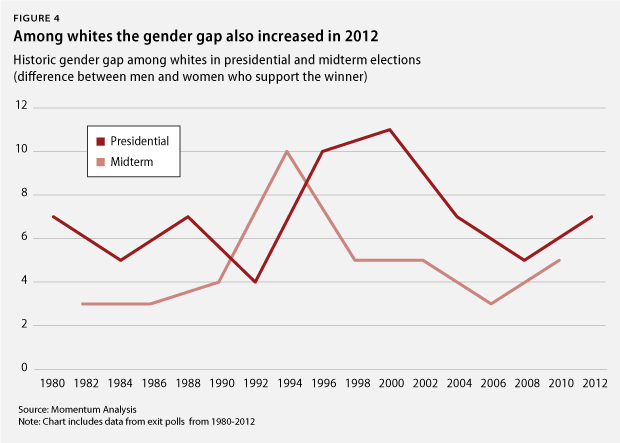 It was also larger than the gender gap among whites in the last four midterm elections. 5. The top issues for women were the economy and a candidate who will fight for them. Abortion may have been salient, but jobs and the economy are still the primary concern. Polling firm Momentum Analysis conducted a bipartisan study of “Walmart moms”—women with kids younger than age 18 and who have shopped at a Walmart at least once within the past month—and found abortion lagged behind the economy as a vote driver for these women. Similarly, according to the official exit polls, Gov. Romney bested President Obama by approximately 14 points with the three-fourths of the electorate who said the most important candidate qualities were that he “shares my values,” “is a strong leader,” or “has a vision.” But President Obama trounced Gov. Romney by 63 points with the one-fifth of voters who said “cares about people like me” was the most important value. 6. Extreme remarks and candidates changed the debate. The election highlighted many candidates’ extreme views on women—not just those who made public gaffes. Much was written, of course, about Senate candidates Rep. Todd Akin (R-MO) and Indiana Treasurer Richard Mourdock’s extreme comments on women and abortion. But there was a lot more where that came from, including, many argue, from Republican vice-presidential nominee Rep. Paul Ryan (R-WI). The campaign back and forth helped delineate the boundaries of what’s acceptable—both as political speech and as policy. 7. Abortion and women’s health issues played a real role. These extreme views might have driven many women voters to the arms of Democrats. A Greenberg Quinlan Rosner Research postelection poll of women who supported President Obama in 2008 and an early December national poll for Planned Parenthood Action Fund both show the issues of abortion and access to birth control helped President Obama more than Gov. Romney. The Planned Parenthood survey found 69 percent of women—5 percentage points higher than all voters—had heard, seen, or read something about Gov. Romney’s plan to “get rid of” federal funding for Planned Parenthood. With women deciding the presidential election, and with record numbers of women in both the House and the Senate, policies helping women must now be on the front burner. Women determined the outcome of the way the government looks, and it is time for lawmakers to answer the call of the majority of voters in the country and make sure economic fairness, pay equity, and issues of work-family balance are on the top of the policy agenda. Margie Omero is the president and founder of Momentum Analysis, LLC, a public opinion research firm based in Washington, D.C. Tara McGuinness is the Senior Vice President for Communications at the Center for American Progress.